discover and create! Emphasis is on imagination, originality, and self-expression. All materials are included. These ballet classes are designed to enhance the children motor, listening and social skills through dance activities. The classes will help dancers with posture, flexibility, fitness, balance, self-discipline and self-confidence. Dancers will learn the basic ballet steps while learning how to follow direction, imitate movement and gross motor skill development games in a positive and fun environment. We offer the skills and drills that make your “future NBA champion” a lean, mean, dunking machine! What’s more fun after school than shooting hoops with your friends? Children choose a different book every week, followed by a hands-on art, sensory, or learning activity. Children work on concepts such as parts of a book (beginning, middle and end), authors, illustrators, plot, characters, and phonetic awareness. This will be a growing experience where children will learn the basic skills of gardening, composting, garden tools, ecology, environmental awareness, earth science, geography, math, language, and horticulture. Children will explore different seeds and plants and will plant different vegetables and herbs that, once they grow, will be used in our cooking classes and school lunches. In this class your child will participate in tumbling and dancing activities, learn basic cheers, and build beginner acrobatic-stunt skills. This is an opportunity for any child who is interested in perfecting their skills in a fun, non-competitive environment. Coding is an activity that teaches children in a basic way how to learn fundamental programming concepts, like variables, loops, functions, and principles of computational thinking. Children will create different fantastic video games, logic games, puzzles, phone apps, fun challenges, character builder and much more. The computer science course helps students build and understand computers by opening a box, pulling out the bits, button, and brain. As they build their own computer all by themselves students will be able to look inside and see how it all works and bring it to life. Kids of all ages will learn about sound, power, pixels, and processors. Learning to code with playful step-by-step challenges that use simple PRECODE BLOCKS, TYPE CODES and LINUX COMMANDS. Starting with simple code and leveling up as they make art, games, and music. Students will follow a story, plug parts, and see how they work. Learning to code art, games and music, make lights flash, with step-by-step challenges to show them how. Bring out your child’s creativity through dance, music, and movement. This class incorporates scarves, maracas, tambourines and more for rhythm and creative expression. Various types of music are used. Children take part in caring for our planet by using recycled materials to create their own planet-inspired masterpieces. All materials are included. An emotional superpower is the power to recognize your emotions and then choose how you will respond to those feelings. In this class, designed for ages 4-104 are tools like music, visualizations and activities that will help you use your emotions wisely. We will also read stories about children who use positive words when they are feeling sad, take deep breaths when they are feeling angry, and use aromas from plants to help calm, motivate, or forgive. Remember, learning how to use feelings wisely takes mindfulness, practice, and superpower action. Learn to rock the six string while playing Top 40 songs and classic rock. In addition, the basics of music theory will be taught. Class curriculum will consist of working on ear training, reading music, performance, and form. Students are encouraged to use their creativity while having fun! This energetic class will feature basic tumbling, balancing and movement activities. Children will have warm-up time. Yoga routines are included to enhance proper breathing and relaxation. In this class children will cook and learn about foods from different countries and cultures. All classes will be age appropriate and geared towards their maximum development. Children will learn step by step about preparing food. They will also learn about the ingredients being used (where they come from, nutrients, measurement and more). One of the goals is for the children to have hands-on experience and then be able to taste the foods they have worked on. All ingredients will be organic and natural with no artificial colors, and some will be from our own garden! Kidokinetics inspires kids to get up, get moving, and get in shape as we set the tone for a lifetime of physical fitness.In our unique program your preschooler will learn about the human body (anatomy, physiology, and nutrition), move and exercise, and have fun in a non-competitive, safe, and encouraging environment. Your child will learn a NEW sport EACH week, working on basic skill development, balance and coordination. Some of our sports offerings include: Badminton, Basketball, Bowling, Football, Frisbee, Golf, Hockey, Jump Rope, Lacrosse, NoodleKinetics, Nutrition, Obstacle Course, Parachute Games, Push-ups, Sit-ups, Soccer, T-ball, Tennis, Track & Field, and Volleyball. We look forward to a FITastic semester with your child. Children will learn while having a blast, transforming any conductive material into keyboards, game controllers and musical instruments. Bananas, oranges and carrots can be transformed into musical instruments and Play-dough will make an amazing game controller. These are only a few examples of the many different projects that are going to be built in these classes of KIDTRONICS. This is an interactive program where children will learn the basics of the Mandarin language, setting a foundation for future language development and advanced learning. They will learn pronunciation with the “Pin Yin” system and emphasizing on the tones. This class goal will be for children to speak short sentences, count, name family members, colors, animals, and basic daily courtesy words. This class will also incorporate cultural knowledge experiences like cooking and making chop sticks. Audio and visual technology will impact in the children’s learning. Taught by Wendy Fong, an experienced teacher who has been working with children and adults for more than 20 years. A kid-friendly engineering program that entices children to explore the world of engineering, technology, and robotics. Explore mechanical engineering associated with structures and machines including, robots! Structures such as bridges, trusses and arches, cantilevers as well as different machines such as wedges, incline planes and gears will be explored in depth. We help develop early literacy skills such as letter recognition, beginning sight vocabulary, and phonemic awareness through small group games and shared reading. Math tutoring uses small manipulatives and games to practice counting, sorting, classifying, and number recognition. Lessons are tailored to the student’s competence level. Your child’s imagination and senses will be stimulated by this hands-on class, where we conduct experiments designed to stimulate the imagination and the senses. Children conduct experiments, observe, compare, create, and solve problems in multiple scientific disciplines. All materials are included. Children love this incorporation of aerobics, gymnastics, and martial arts. Through fun physical activities, they will develop focus, coordination, strength and discipline. SlimeWorld is a totally “hands on” class. A class full of sparkles, colors, fragrances, and fun. Children will use all their imagination and creativity while making all kinds of slimes, bath bombs, soaps and more. Materials are included. Soccer provides an escape for physical fun and promotes cooperation, team play and spirit. In this interactive class, children learn basic Spanish vocabulary by identifying objects, playing games, reading stories, and singing songs. Introducing a new language at a young age sets the foundation for future language development and acceptance of other cultures. Learners will experience dramatic play, costume design and stage direction. They will have an opportunity to engage in improvisation as well as guided performance. This introduction to tennis is an excellent way for children to learn this great sport. Games and activities will provide in-depth development of hand/eye coordination, an essential skill for mastering tennis. All equipment included. Improve your all-around well-being by incorporating exercise, stretch, relaxation, and ways to explore new movement. Yoga Music is filled with games, laughter, poetry, music, songs, and tons of yoga poses. This Zumba class is a high-dance party packed with kid-friendly routines. We break down steps, add games, activities and cultural exploration elements into the class structure. This class helps develop a healthy lifestyle and incorporate fitness as a natural part of children’s lives. Classes incorporate key childhood development elements such as leadership, respect, team work, confidence, self-esteem, memory, creativity, coordination and balance. Choosing the right After-School program is a very important decision in your child’s development. Our outstanding extracurricular, skill-based classes keep children ages 2-11 active and engaged. With our large variety of programs, children can hone in on existing talents or find new interests. Providing our programs in a safe and engaging environment is our priority. For every stage of your child’s development, we offer academic enrichment, physical fitness, and nutritional and life skill programs to challenge children and make learning fun. We provide a healthy snack. 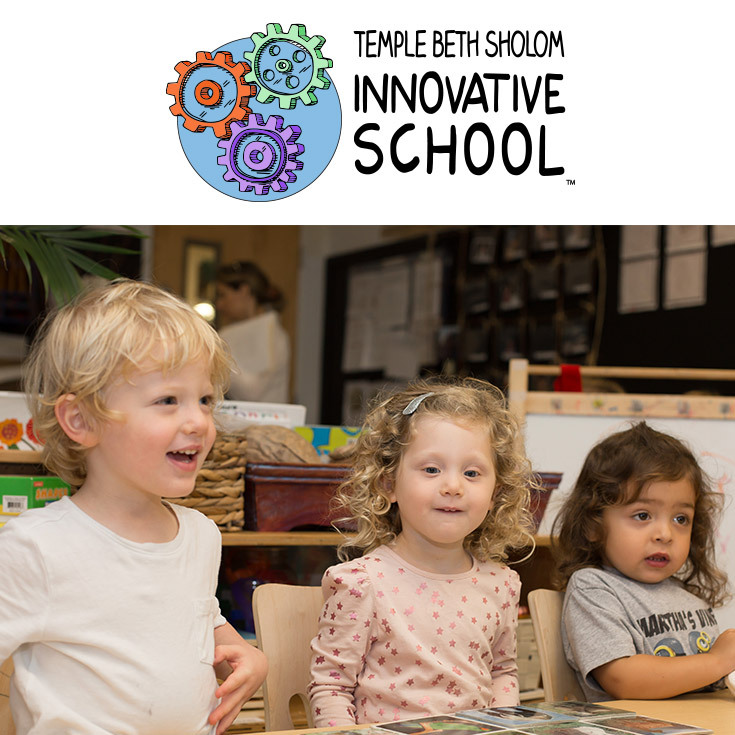 We employ experienced DCF-certified Temple Beth Sholom Innovative School staff to supervise each program. Early Care (7:30 to 8:30 am), After Care (2:00 to 5:00 pm) and Extended Care (5:00 to 6:00 pm) are also provided. During these times a variety of academic enrichment activities, indoor and outdoor games, and creative art experiences are planned for your child’s time in our program. For questions regarding our After-School Enrichment opportunities call Dalia Katz at 305.538.7231.